This week, the good people at Vice.com asked me to write about Ron Paul, because we both thought Newt was just too tiresome, and, "Please, God [we're] sick of Herman Cain. No more Herman Cain." A lot of this Paul information isn't new. That's because Ron doesn't change. Time lumbers on, indifferently, into a bigger future, and he remains, hiding behind his 18th century battlements, picking lice off himself, rubbing coins fervidly and wearing a special kind of hat that says, "You can't force me to be a bowman if we fight France." 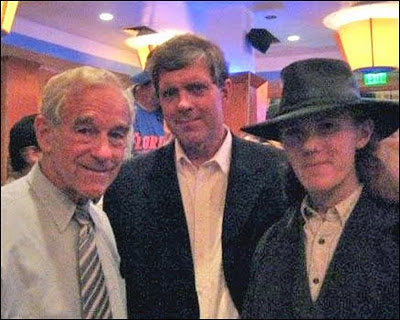 By the way, the nice fella in the picture with him is Don Black, founder of Stormfront.org, America's #1 white supremacist site, which endorsed Ron Paul in 2008. (Even now you can find great information about him there, like, "All Republican candidates are Jew tools except for Ron Paul," which, perversely, is a fair reading of the GOP establishment's Israel policy.) The Paul campaign spent weeks pretending the endorsement and Stormfront's donation weren't an issue. That might have had something to do with not wanting to alienate supporters, like campaign coordinators who are Klansmen and neo-Nazis, or campaign volunteers like neo-Nazi Holocaust Museum shooter James van Brunn.